To engender a lifelong love of reading, writing and language through the immersion of stories and texts that interest, inspire and excite our children. We strive for children to read a variety of genres and use these as models for their own writing. The staff at Hillside are committed to providing a reading culture and supporting children in developing good reading habits that will support them throughout their education, in their personal life and beyond. Pupils at Hillside are taught to speak clearly and convey ideas confidently using standard English. We encourage children to justify their ideas with reasons; ask questions to check understanding; develop vocabulary; negotiate; evaluate and build on the ideas of others and select the appropriate register for effective communication. It is evident to anyone who visits Hillside that there is an ethos where children feel safe and valued, thus encouraging them to interact in a respectful and expressive manner. The classroom environments are stimulating and creative and there is a rich diet of vocabulary in and around the school which enhances the speaking and listening skills being taught. In every classroom at Hillside, you will observe the use of many cooperative learning strategies (kagan structures) to enhance speaking and listening such talk partners; children as teachers; talking tokens, quiz, quiz trade, think, pounce, bounce and other structures. We encourage children to show respect and respond to the views of other children and adults in an appropriate way and this is done at every point of the school day, not just in focused English lessons. Our reading curriculum is designed to produce productive, creative and well-educated students. The challenging and ambitious expectations of the National Curriculum are reflected in our aims and beliefs of how reading should be taught at Hillside. 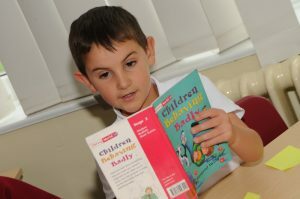 Pupils within our school are taught to read fluently and encouraged to read for pleasure. Our reading scheme is primarily Oxford Reading Tree, however it is peppered with other schemes such as Collins and Usborne to ensure children are exposed to varied authors and book styles. As children progress through the reading scheme there are opportunities to read modern and classic fictional novels. A wide variety of fiction and nonfiction books to ensure children read a variety of genres and text types. Decodable books for children learning to read. Daily synthetic phonics sessions take place daily from Nursery to Year 2 and in cases where children still require the teaching of phonics in KS2 it is done through specialised phonics interventions and the use of a phonics reading scheme that is based on a context aimed at their age range. Children have high quality whole class reading sessions daily. These lessons are focused on word reading and discussion, incorporating comprehension, exploration of vocabulary and dictionary skills and comprehension, in particular inference and deduction. Excellent use of the library area where children are encouraged to read in their own free time. ‘Author of the Term’ initiative used in all classes to develop the children’s love of reading. Reading logs used by ‘Independent readers’ to ensure they are reading a wide variety of texts. Reading promoted in the form of visits from authors, book weeks, book fairs, drama workshops and theatre visits etc. ‘Reading for pleasure’ units of work integrated into English teaching to encourage more flexibility with the types of texts read in class. Children have ‘Reading for Pleasure’ texts boxes in their classroom that encourage them to read widely. The books are suggested titles for their age range and the children use book reviews to identify the effective features, favourite characters, similarities and differences and encourage children to recommend authors and genres to other readers. High quality texts used in school across all subjects. Children are challenged to read five times per week to ensure they develop the habit of reading widely and often and to acquire a wide vocabulary to support them in their use of grammar and linguistic conventions for reading, writing and spoken language. Whole class teaching of reading allows teachers to plan activities that allow children to practise using the relevant reading skills: vocabulary, retrieval, summary, inference, prediction, compare and contrast and author choice. It also allows the teacher to work with the children that need it the most at that time. Differentiation is achieved in many ways: the difficulty of the text the children are working on; the questions the teacher is asking or the level of support they are receiving. Teaching the whole class the same objective removes the problem of independent groups, it allows our teachers to focus on one objective in depth and better prepare children for the expectation of written responses at the end of each key stage. A two week reading cycle is utilised that incorporates a forty minute introductory session of a chosen text and further daily twenty minute sessions that include in-depth analysis of vocabulary, group comprehension questions, marking and feedback sessions and the cycle ends with an independent assessment task. The assessment is used to provide teachers with evidence that the children are making progress in reading. We encourage children to read at least five times per week through the Reading Rocket challenge. The children are asked to read fives time per week to develop the habit of reading widely and often and to acquire a wide vocabulary to support them in their use of grammar and when writing. Regular assemblies are held to promote this and the children are rewarded with letters home, extra play time, a small individual prize and they are all entered into a draw to win a prize that has been voted by the children themselves. This can be anything from a Kindle to a shopping voucher to a ticket for a day out. The Author of the Term initiative encourages children to read texts by the same author. The children research the chosen author and understand their achievements and inspiration for writing children’s stories. Author of the term displays are evident in each classroom from Nursery to Year 6. These are changed either half-termly or termly depending on the length of the texts and amount of texts the author has written. This initiative promotes a love of reading as children are exposed to up to thirty-five high quality authors in their school lifetime. The children learn about their life, inspirations and get lost in their stories. Parents are welcome to buy further texts by the authors promoted in class for home reading and we endeavour to stock as many of the Author of the Term texts in our library and book corners to encourage children to become familiar with similar genres and styles before moving on to the next author. As Hillside, we have selected twenty-five books per year group that we believe could be shared or read before the children leave. These are a mix of classics, modern fiction and award/prize winning books. We want to expose our children to many different authors and books in lessons and as additional texts that they can read and enjoy at school and at home. These 25 texts are recorded in a Reading for Pleasure booklet. The children highlight or colour each box once they have read the text. If children succeed in reading the twenty-five books suggested during each year group, they could potentially read two hundred texts by the time they leave Year 6. Children have opportunities to visit the school Library on a weekly basis. Children are encouraged to read for pleasure at home and at school and the books stocked in the library are chosen and organised by the children themselves. Furthermore, Hillside collaborates with the local library and invites them in to speak to both children and parents. The sessions begin as early as Nursery where reading for enjoyment is promoted through the use of the library and the many events that it runs. An initiative that is welcomed by children from the EYFS is the ‘Little Library Van’ that pays the children an annual visit to encourage positive reading habits; and again parents are invited to share this experience also. See below for documents relating to Reading at Hillside. At Hillside we aim to inspire children and encourage the development and application of imagination. We develop the children’s ability to produce well-structured, detailed writing in which the meaning is made clear and which engages the interest of the reader. Attention is paid throughout the school to the formal structures of English, grammatical detail, punctuation and spelling. Teachers model the ‘craft of writing’ and the use of phonics and spelling strategies are a focus of shared writing sessions. The children are given frequent opportunities in school to write in different contexts and for a variety of purposes and audiences, using quality texts as a model. There are many opportunities for children to improve their writing inspired by drama techniques and film clips. Extended, independent writing takes place on at least three occasions over a term and there will also be additional examples in subjects such as history, science and geography, demonstrating that our children are able to apply their skills across the curriculum. During the writing process, children are encouraged to use a ‘slow write’ technique that involves writing a piece of work over a number of days. At the end of each day the children are given feedback to encourage them to improve or extend their writing. They act upon this feedback before they begin writing on the next day. These pieces of writing help to provide a clear assessment of the children’s current writing stage and their areas of development within writing, spelling, grammar and punctuation. At Hillside we have a clear programme of study for the introduction and acquisition of knowledge about grammar and punctuation. Our English sessions are well suited to the practical development of this knowledge through the word, sentence and text level work provided in class. Teachers turn every available minute of teaching into valuable learning time. The first few minutes of the day or English lesson are given over to the practice of essential language skills. In spelling, we value and encourage children as they move through the developmental stages of learning to spell, but we also recognise the importance of mastering and using accurately conventional spelling in order to convey meaning clearly in writing. Presentation of written work reflects the awareness of the writer to the needs of his or her audience. Our ultimate goal is for pupils to achieve a fast, flowing, joined, legible style of writing. In order to achieve this, we are aware of the need for a consistent approach to the teaching of handwriting across the key stages. Our aim is for all children to write fluently, legibly and with increasing speed and to understand the different forms of handwriting used for different purposes by the end of KS2. 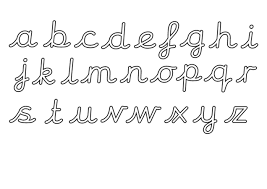 At Hillside we use the Letter Join handwriting programme to enhance the teaching of handwriting in all key stages. We aim to make handwriting an automatic process that does not interfere with creative and mental thinking. Handwriting is a cross-curricular task and will be taken into consideration during all lessons. Formal teaching of handwriting is carried out for 30 – 45 minutes per week to ensure children become fluent and legible writers. Quality daily phonics lessons that last between 15-20 minutes. Careful differentiation for all ability groups, addressing the needs of children with special educational needs, including gifted children, based on ongoing formative assessment and teacher judgement. Well planned interactive lessons, delivered at a brisk pace, that keep children engaged and focused. Opportunities to reinforce and apply acquired phonic knowledge and skills across the curriculum. Additional decodable reading books for children to apply their phonic knowledge in phases 2-5 continuing in to the reading scheme in KS2 to ensure children have grasped the basis of reading. At Hillside we have a clear programme of study for the introduction and acquisition of knowledge about grammar and punctuation. Our English sessions are well suited to the practical development of this knowledge through the word, sentence and text level work provided in class. Teachers turn every available minute of teaching into valuable learning time. The first few minutes of the day or English lesson is given over to the practice of essential language skills. Regular patterns in words and non-standard forms. The structure of words; compound/complex words, prefixes, suffixes, roots and origins. High interest words associated with topics and specific curricular areas. A variety of strategies to enable independence in spelling, such as word banks, dictionaries, displays, mnemonics etc. Speaking and listening runs throughout the whole of the EYFS. There are stories, rhymes and role-play every day where the children have the opportunity to talk, listen and join in. We encourage the children to take their first steps in early reading and writing through role-play, free choice activities and focussed teaching sessions. Nursery and reception have a library session each week, where the children are invited to choose a library book to take home. They also bring home early reading books, letters, sounds and words to practise and learn. Physical development is particularly important in the EYFS as children develop the use of their gross and fine motor skills through initiatives such as dough disco and play with malleable materials. This eventually leads to children being able to handle writing equipment effectively –an essential step in learning to write. Assessment is used to inform planning and teaching. Teachers use assessment against year group statements to update the online assessment tool. In writing, teachers are constantly assessing and independent writing tasks in any subject can be used to provide evidence that a child has achieved the objectives they are working towards. These assessments inform future planning for reading and writing sessions. Summative assessments in reading, SPaG and phonics take place at the end of each term for all children from Years 1- 6. These assessments are used to provide information about how well children have retained knowledge and understanding in a given area over time. These assessments provide teachers with information about each pupil and help to identify areas of strength and areas which need development or support. In Early Years, children’s reading skills are monitored and assessed through 1:1 reading sessions, phonics tracking and the ability to read high frequency and common exception words on sight. The phonics tracking document is also used in Years 1 and 2 to monitor progress. The class teacher assesses the level of the children’s individual reading books termly during whole class reading or 1:1 sessions, to ensure the level is appropriately challenging. 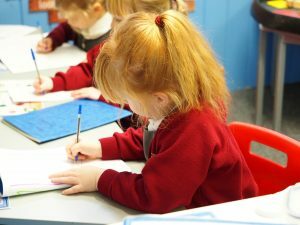 All children from Nursery to Year 6 are asked to make judgements about how they can improve their own work, through a range of self-assessment techniques (e.g. marking codes, thumbs up – thumbs down etc). Children are also given the opportunity to take part in peer-to-peer assessment where they support their peers in looking at how to improve their work. At the end of every lesson, each child uses the code A, B or C to demonstrate the effort they have shown within the lesson and 1,2 or 3 to demonstrate their understanding of the learning objective. In response to this, after the teacher has marked the child’s work, they also use a marking code to show how much the child has understood. Discrepancies between child and teacher assessments are then addressed if necessary. In addition to these in-school assessments there are statutory assessment that take place. In Year 1, children take part in the Phonics screening in the summer term. Children who did not pass the test in Y1 retake the test at the same time of year in Y2. In Year 2 and Year 6 the children take a formal reading and SPaG assessment as part of SATs.